Mom Loves 2 Read: Fresh Beat Band comes to Iowa in October ~ check it out on Loves 2 Read! Fresh Beat Band comes to Iowa in October ~ check it out on Loves 2 Read! The Fresh Beat Band is Coming to Town! a Family Four Pack of Tickets to this show! Register to Win a Family Four Pack! The Fresh Beat Band debuted in 2009 and is now in its third season on NIckelodeon. 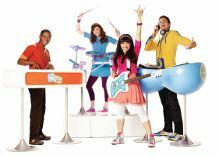 The Fresh Beat Band centers on four best friends ~ Kiki, Shout, Marina & Twist, in a band who LOVE to sing and dance. In each episode, preschoolers and young kids sing and dance along as they help The Fresh Beat Band solve everyday challenges. See The Fresh Beat Band Live in Concert at the Adler Theatre in Davenport, Iowa on October 19th. All promotional materials listed above were provided by America's Family Network and USFamilyGuide. If you have any questions or comments, please see my FTC disclosure or Review Policy.